In addition to putting in a full workweek few people actually volunteer to work their weekends, unless you’re a workaholic. But when an opportunity for a Sunday afternoon cruise (i.e. 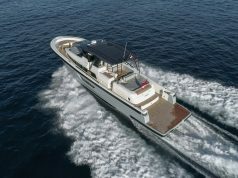 sea trial) on the new Formula 430 Super Sport Crossover (SSC) is offered, you take it. 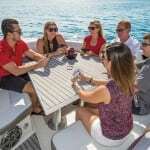 In a post-recession market economy where every boatbuilder seeks to introduce the newest and best flagship model in time for the fall boat shows, Formula’s 430 Super Sport Crossover presented itself as one of the strongest contenders at the 57th Annual Fort Lauderdale International Boat Show last November. That shouldn’t be a surprise for cruiser-style aficionados since Formula has been debuting revolutionary new products for some time. 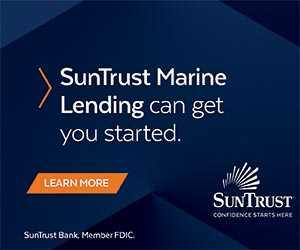 Their original, very successful line of Super Sport models bridged the gap for boat buyers wanting a sleeker version of their cruisers. 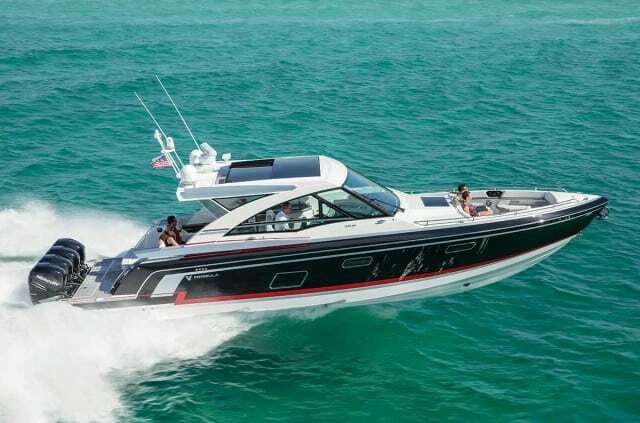 Then about four years ago, Formula debuted its 350 Crossover Bowrider. 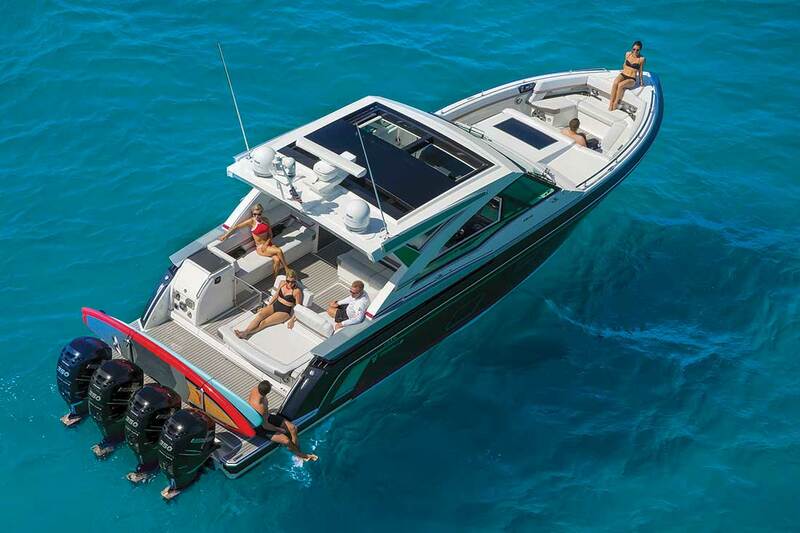 The 430 SSC concept followed, was two years in the making and designed from the outset for outboard propulsion as the market grew significantly. Formula designer John Adams used the glass grid, stepped-hull concept of the 370 and 400 Super Sport models from which to base Hull No. 1 of the new 430 SSC design. 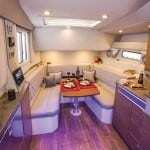 This first hull is not for sale but is being featured exclusively at boat shows and for sea trials. Consequently, it’s decked out with every possible option imaginable. Even at first glance the high-tech and somewhat futuristic styling is immediately apparent with its sharply angled edges, window design elements and strong color accents. (It almost reminded me of the “Transformer” toys my sons used to play with.) On the 430 SSC “high-tech” is more than just an exterior design style, and more examples become evident once you’re on board. Starting at the side console helm, each of the three seat bottoms adjust individually for three different positions with adjustable footrests. 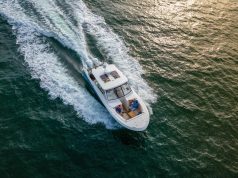 While adjustable seats may not necessarily qualify as high-tech, what does qualify are the strategically placed air conditioning vents in the seat backs that keep the skipper and crew cool on hot summer days. 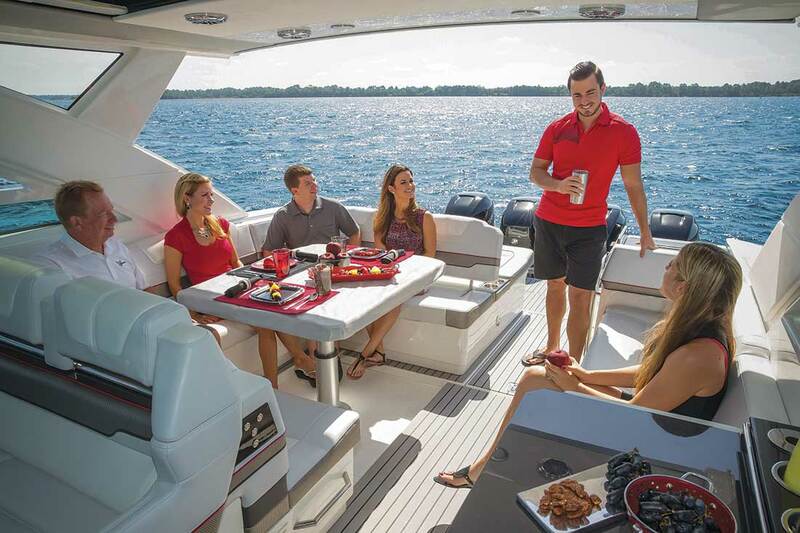 A Yeti cooler that slides out from under the helm seat provides easy access to beverages. 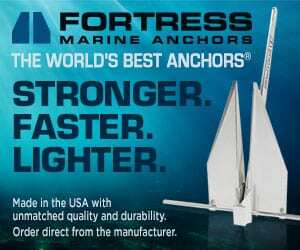 The dash accommodates either three 16-inch or two 19-inch Raymarine chartplotters in addition to the Raymarine gS95 master control and wireless iPad™ control with Mercury DTS with SmartCraft VesselView. Quad Mercury 300 Verado outboards are standard, but you can upgrade to Quad 350s or 400s. Now, in case you suspect the high-tech on board is limited to the helm, think again. The 430 SSC ensures that your digital-savvy passengers—especially those with a penchant for taking selfies—have fully charged devices at all times. 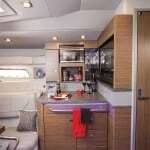 USB charging ports are located throughout the boat in all the seating areas. To keep your tweens and millennials further entertained, their playlists can be synched with the Rockford Fosgate® AM/FM stereo system mounted at the dash with iPod/USB port and Bluetooth. 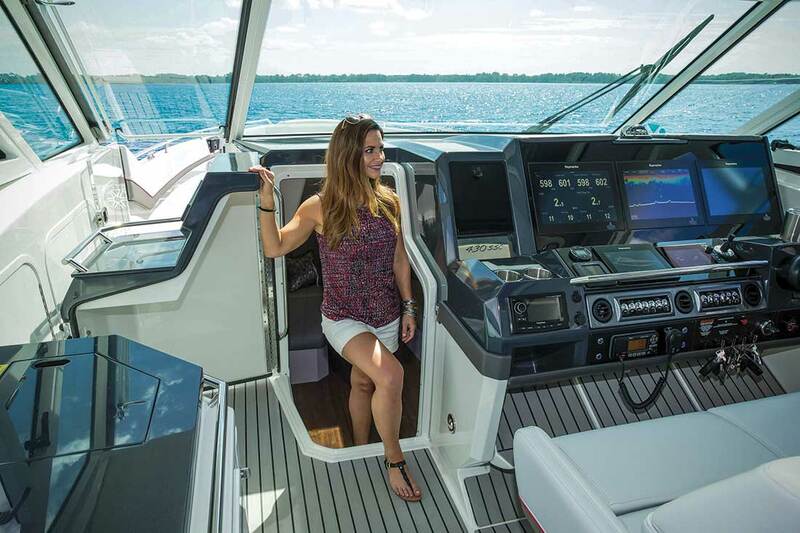 Ten JL Audio® blue LED lighted speakers in the cockpit complement the blue-white LED lighting in every zone on the boat. For extra tech appeal and entertainment, opt for the “Sound-to-Light” upgrade with Wi-Fi control features to sync their music to the underwater lights for a fun light show. 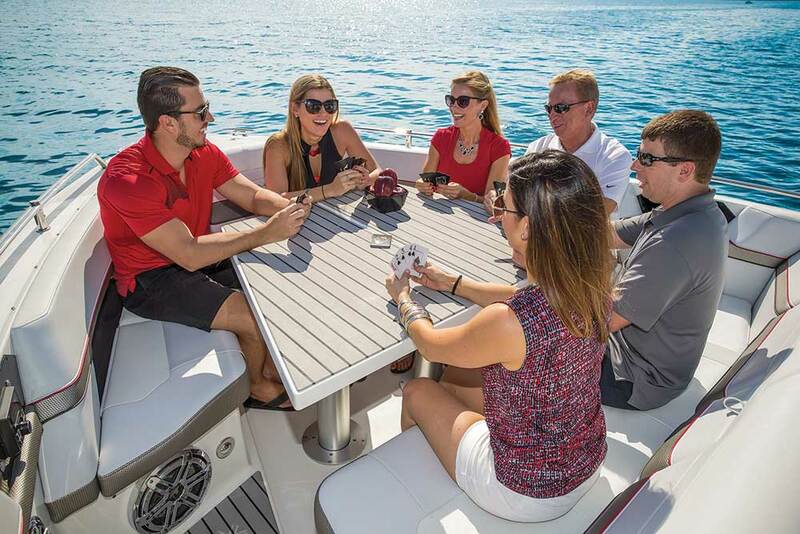 Whether your guests like sun or shade, wind or calm, the 430 SSC’s multiple seating zones ensure every guest experiences the ride and view they prefer. There truly is not a bad seat on the boat, and I tried every one of them. 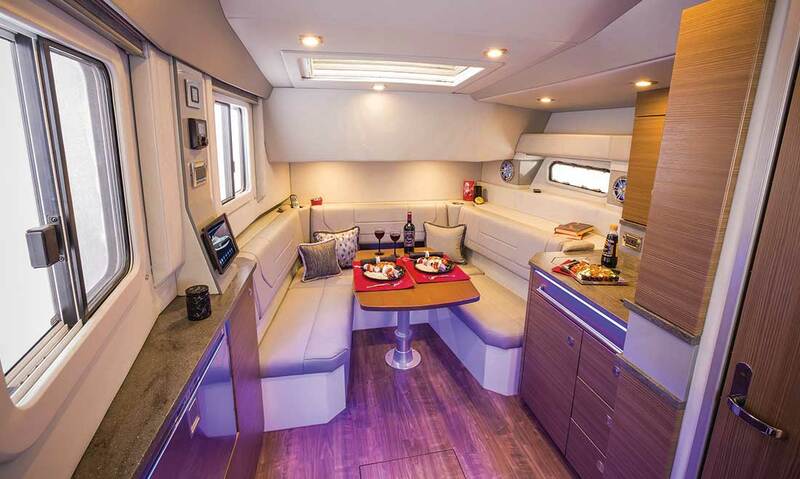 Two defined seating areas in the 430’s SmartZone design—a U-shaped lounge with a settee on the port side—are cushy and comfortable. 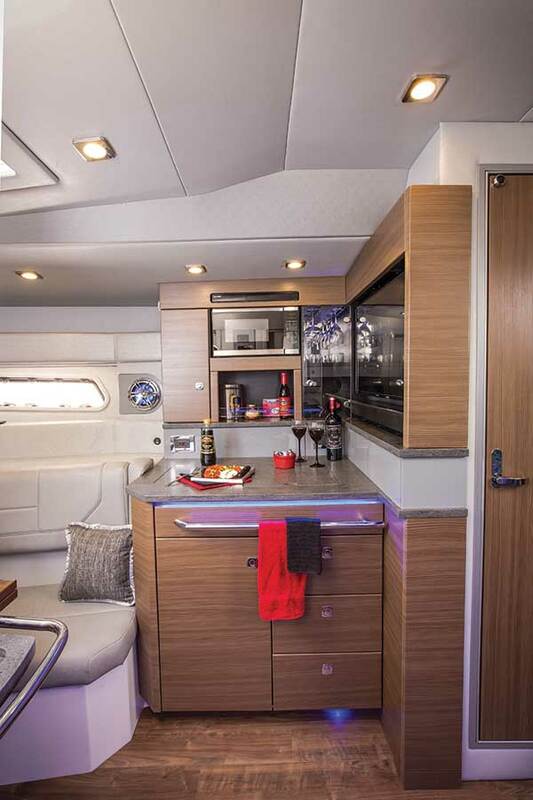 The lounge backrest can be pushed forward to be used as a backrest for the aft sunpad, but if there’s not enough room for everyone wanting sun, just open the motorized glass sunroof, lower the cockpit table and insert the filler cushions. The forward seating area also transforms into a sunpad by lowering the table and inserting filler cushions, or a sunshade can be inserted for a welcome respite. 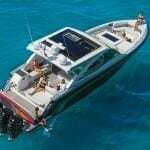 With separate stereo control, a dual-compartment cooler and trash container, the bow area transforms into its own private, onboard oasis. The chef on board has his choice of two locations for food prep. The outdoor kitchen with optional electric grill includes a storage drawers, Corian® countertop, fiberglass molded sink, stainless pullout fridge, dedicated trash container, and paper towel holder. For buyers of outboard models in this size range, I’d be hard-pressed to decide exactly who wouldn’t like the 430 SSC since it addresses so many needs. 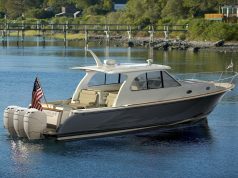 It’s as if all the high-demand elements of Formula’s very successful models were transformed into a completely different package with a personality all its own: part open bow, part cruiser, part center console, but still all Formula, all fun! Next articleSpring Cleaning? Don’t Miss the Engine Room!